Episode of the coronation of Emperor Nicholas II, 1896. In the spirit of the monarchical Russia of the end of the XIX century is time to celebrate. The main square of the city has been embellished: corridors are dressed in beautiful red carpets, people everywhere has been organized according with its social status in an aesthetical order that catch the looks; sentinels are deployed all over the place in metrical synchrony, they protect, bow and adorn, they are symbols of power as the lions in front of the magnificent buildings. The day is clear and the gentlemen of army forces are there to support the new commander. In the background, two temples put in evidence the architectural advances of the time. It is an episode of the coronation of the Emperor Nicholas II, 1896, depicted by Adolf Iosifovich Charlemagne; in the calendar of historical events, this represent the last moments of joy, in a region where the most drastic changes are waiting to happen. 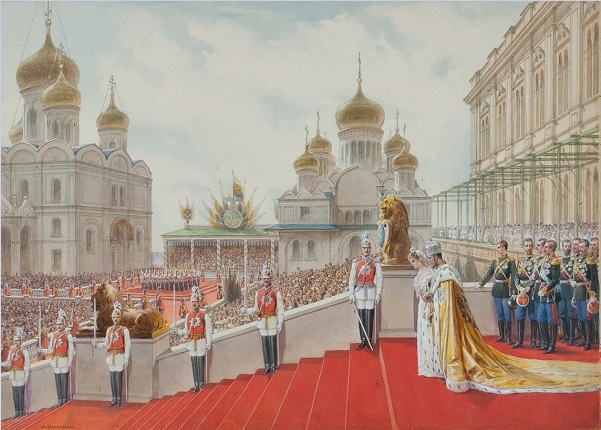 Crowned Tsar, Nicholas II and her wife stand in front of the palace and greet the crowd with a soft bow. The visual order of the elements in the picture, the cumulus of straight lines creating a panoramic view culminate focusing a few steps of the emperor, character who is dressing a legacy of golden responsibilities that, as a cloak, hangs from his shoulders. 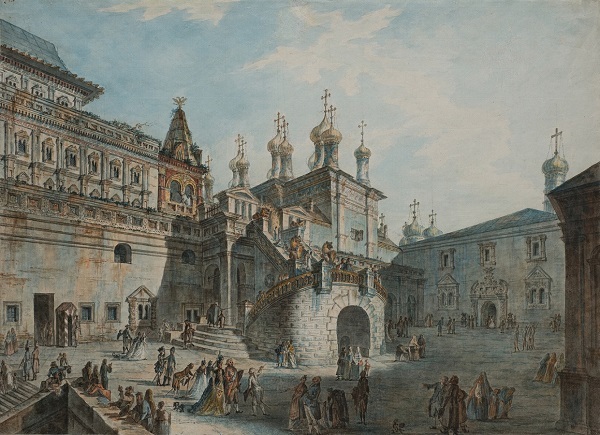 The Tretyakov Gallery Moscow, jointly with major Russian Museums takes seriously its mission to present to audiences the best of its collections, so it has prepared a selection of unique watercolors to be exhibited until this may 6, 2018. Mainly based in artworks that never have been shown to general public, the curated pieces, taken from the State Historical Museum, sail to port as perfect exemplification of the visual achievements from the technique of master artists at the time. 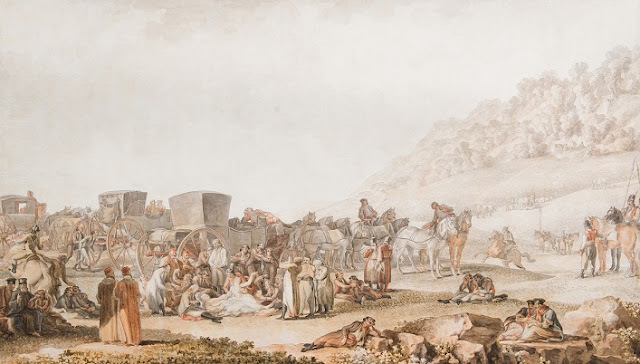 The oeuvres comes from the Russian artists of the 19 th century, special attention has been put in a section dedicated to those works commissioned by the imperial family, a historical visual documental to be appreciated. By its quality, the exhibition is a key pictorical reference to be spread all over the world to teach actual aspirants to real art practice the importance of technical abilities in the pursuit of aesthetical valuable results. 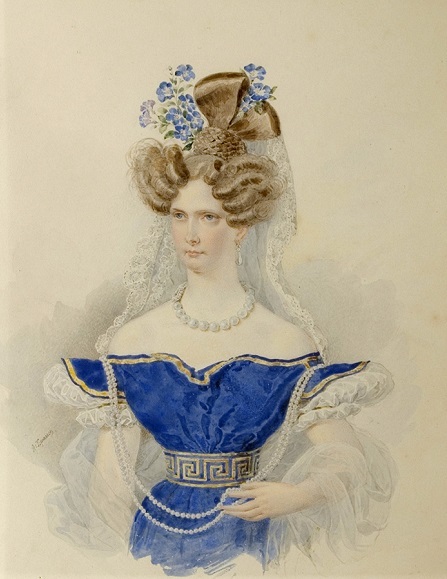 Portrait of the Empress Alexandra Feodorovna, early 1830s. 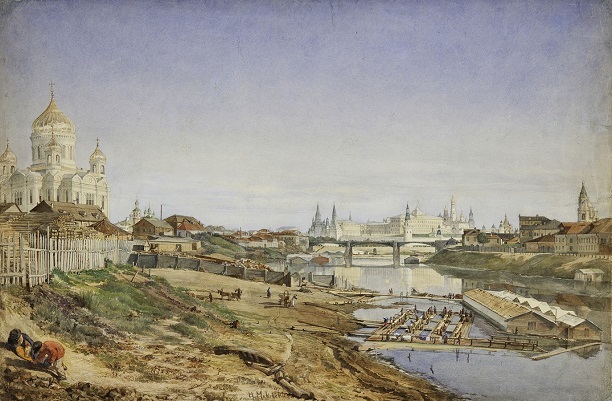 The Death of HSH prince GA Potemkin-Tavrichesky in the Bessarabian steppes, 1791.
the Stone bridge and the Kremlin from the Moskva river embankment, 1860s. 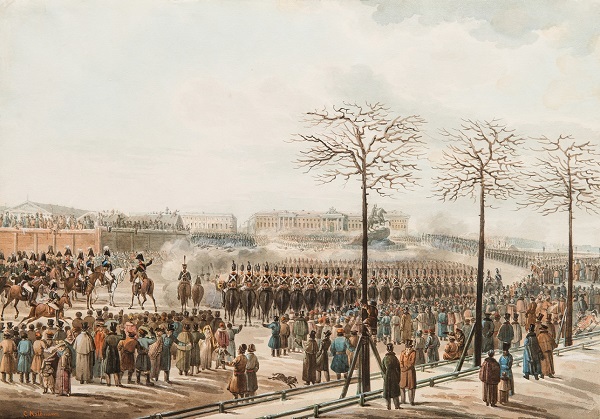 The uprising on the Senate Square in the St. Petersburg on December 14, 1825 - 1830s. 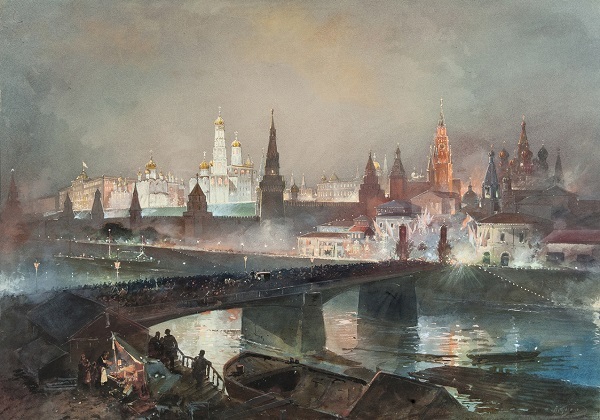 Illumination of the Kremlin during the celebration of the coronation of Emperor Nicholas II, 1896.